The reading of Alice brings out the subtlety and irony of the a clever little girl lost in a topsy-turvy world. Down the Rabbit Hole. 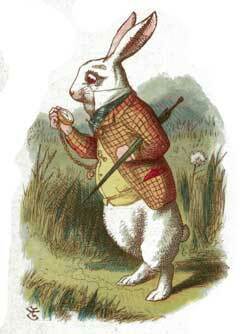 Alice follows a White Rabbit into a hole, and falls down, down, until she lands softly. She finds a bottle with a label Drink Me – and she does. Soon she shrinks. The Pool of Tears. Alice continues her out-of-the way experience as she stretches like a telescope, and then almost shrinks away alltogether. She has a wonderful conversation with her feet, and she dreadfully offends a mouse. It all ends in tears – so many tears that Alice and the mouse are swimming in them. A Caucus-Race and a Long Tale. The Dodo bird is far from dead. The mouse tells a very “dry” history to try and dry out Alice and the other creatures who are still wet from swimming in the pool of tears. They run a race (a caucus race is actually an election). The Rabbit Sends in a Little Bill. 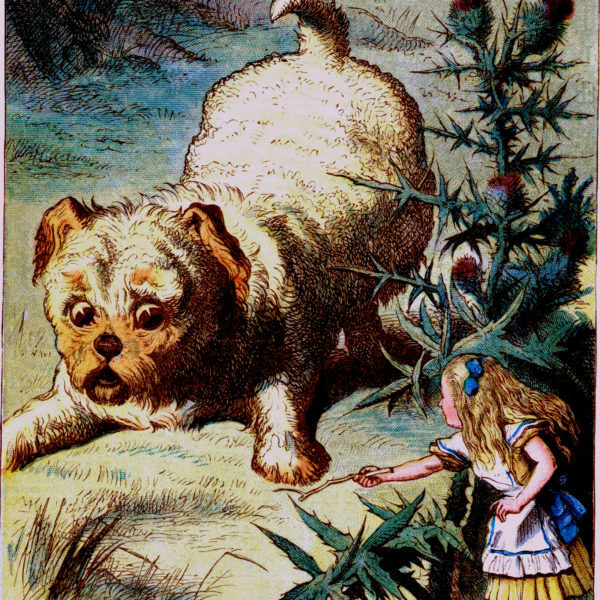 Alice tries to help out the white rabbit, but grows so large that she is bursting out of his house. She is besieged by small animals and has a confrontation with a enormous puppy. Pig and Pepper. We meet the Duchess, roughly handling a baby who looks like a pig, and the Cheshire cat who likes to vanish leaving only his grin behind. All this and two footmen who look like fish. The Mad Hatter’s Tea Party – one of the most famous of all chapters in children’s literature – is here presented in all its wonderful lunacy. A mad March Hare, an even madder Hatter, and a dozy dormouse provide company for Alice at tea table where the party never ceases because time is stuck perpetually at 6pm. The Queen’s Croquet-Ground. It is a wonder that anybody is left alive, the Queen is so busy calling for the executioners. The Queen meets her match though in the disappearing form of the Cheshire cat. The Mock Turtle’s Story. We meet a Gryphon and a Mock Turtle. A Gryphon is a mythological creature and a mock turtle was a type of Victorian Soup. They make strange company.